Freshly picked and timely cooked sweet corn is one of the great pleasures of the vegetable garden calendar. With every bite full of succulent sweetness, the new world’s sweet corn truly encompasses the taste of the summer sun. 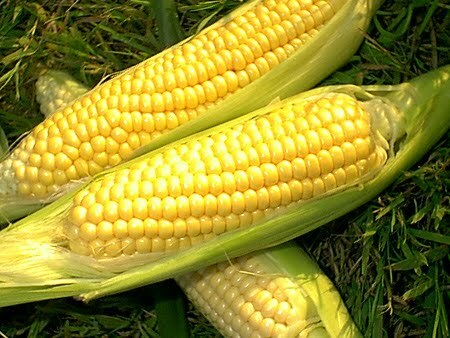 However, to get the best out of your sweet corn crop there are a few simple guidelines. Sweet corn prefer a free-draining, and moisture retentive soil. If you can remember to, it is best to try and prepare the bed the previous autumn before planting the following spring. Dig it over to remove any perennial weeds and add plenty of well-rotted manure to the soil as you go. Don't worry if soil preparation ends up being a ‘last minute’ exercise, sweet corn beds can still be prepared in the spring. Again, remove any weeds and dig over the site with a spade, removing any particularly large stones. Roughly level the ground and then work over the area with a rake to leave a fine finish. Then - to ensure your crop gets off to a flying start - spread some general fertilizer granules over the planting area and gently rake in to the surface. Try to have this done two or three weeks before planting or sowing. Once the plants are of a reasonable size you can also water using a liquid feed once a week to help accelerate growth. 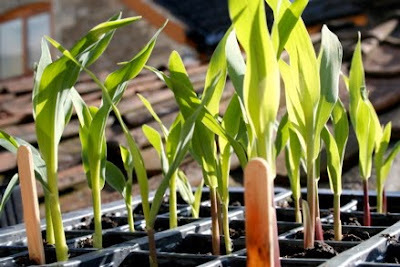 You can either sow sweet corn seed directly into the soil or consider planting ready-grown sweet corn plants which can establish quickly and provide cobs earlier. Ready-grown plants can go into the soil from May until June, while seeds can be sown directly into the soil in late spring to early summer. In cooler climates it's worth protecting the emerging seedlings with horticultural fleece. Sweet corn are wind pollinated and are best planted in large blocks, where the male flowers at the top of the plant have more opportunity to shed their pollen on the female tassels below. The absolute minimum number of sweet corn plants you would need to grow for effective pollination is 5. These will need to be planted in the shape of a square – one in each corner with the 5th one in the middle. For this shape there should be a gap of approximately 12 inches between each plant. When creating larger blocks, plant sweet corn seeds, or seedlings, 12 inches apart with a 2 ft space between rows. For effective pollination you would need to consider planting at least a dozen – preferably more. Each plant will produce one or two cobs, so work out how many cobs you're likely to need (you can freeze them) and provide enough space to achieve this. However, there are no rules about how large the block has to be as it can only be determined by how much corn you decide to grow. Keep plants well watered and the soil weed free, but take care not to sever the surface growing roots of the sweet corn when using a hoe. In fact to protect the surface roots – as well as give the sweet corn plants more stability - pile soil up around the stems using a trowel or a draw hoe.